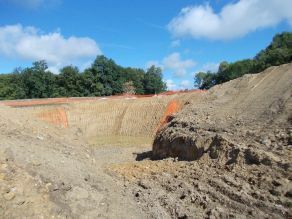 Work is underway on Boussac’s nine eoliennes – wind turbines. There will be seven in Bussière St Georges, the next commune along from us, and two in St Marien. It’s slightly odd to be building them around here as it’s definitely not a very windy part of France, and there isn’t a great deal of energy-draining industry around either. However, there is very little information to find about the development online, just a couple of articles from 2010. It looks like apathy and an enigmatic silence reign in Creuse on the Préfecture’s part since it decided to make Boussac a zone de développement éolien (ZDE) a few years ago. However, I have found out that the project is costing 23 million euros and will supply 22,000 households. I’m guessing we’ll be one. The eoliennes are being built by Guintoli, which is part of Groupe NGE, a French public works enterprise. It’s noticeable that in and around Bussière a lot of ‘A vendre’ signs have appeared on houses. 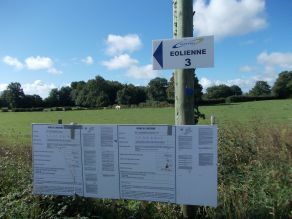 According to the enquiry that was held before the eoliennes were given the go-ahead, the locals were all very supportive. So maybe it’s just a coincidence that suddenly half of them want to move? We have friends who will have an eolienne a couple of fields away from them. They’re quite happy with the situation on the whole, although a little apprehensive about how much noise the wind turbine will make. Yesterday, Chris, Ruadhri and I went on our Sunday morning bike ride to have a look at the site for eolienne 3, which is the closest one to us (and our friends). Six days a week, the place is a hive of activity with a constant stream of lorries going to and fro. Yesterday it was deserted. There weren’t any signs saying it was privée and telling us not to go in, so we didn’t have to ignore them. We cycled along the track and had a nose around. 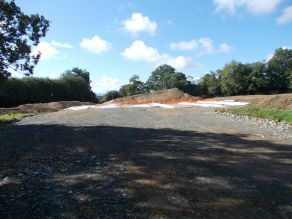 A lot of land has been cleared and levelled, and a huge hole has been dug. And I mean huge. This eolienne clearly needs a very solid base. Wind turbines convert the kinetic energy in the wind into mechanical energy which is converted by a generator into electricity. It’s a renewable source which in these days of climate change is a good thing, so why are eoliennes so unpopular? A lot of people consider them an eyesore, even though they are rather graceful feats of engineering. There’s the question of noise, described as being like a boot in a tumble dryer and audible for up to a couple of kilometres, and also the unfortunate effect they have on bats and some birds. The drop in air pressure close to the wind turbines’ blades causes haemorrhaging in their lungs. The creatures essentially drown. However, kids generally love eoliennes, thanks to the Teletubbies. Here around Boussac, we’ll just have to wait and see what living with eoliennes is really like. A vehement group against them can be found here. Find out about getting your own here. Can you make any sense out of this puzzling map of zde’s in Limousin from 2007?